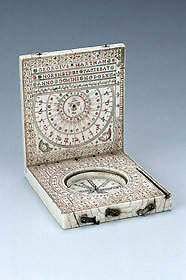 Unlike most ivory diptych dials, this example does not include a horizontal string gnomon dial and has a polar dial on the outer side of the upper leaf. The polar dial is held by a cherub standing on a grid. Its pin is kept in a special compartment on the bottom edge of the lower leaf. The inner sides are extensively decorated with coloured geometrical motifs.